We rearranged our office to line both desks up on the east wall a few months back. We kept backing into each other in the last arrangement. We both wanted an L-shaped desk area, but ended up piling our stuff on the desk used by the other person. We also had a problem with the area around the computer being too small for files and the checkbook. We ended up switching several things around. First we switched the computer to the larger desk and I made the smaller desk my reading area. Then we switched the smaller filing cabinet for a larger one that had been holding my music. The music fit in the smaller unit and now the files are not jammed together so tightly. We also have room to add many files if needed. I am currently storing extra reams of paper in the back of it. The final thing we added was a TV tray. That took the place of the extension we both desired. I keep my Day-Timer on it and he piles papers on it when I am not using the office. During those times that we both need to be working, like when we were preparing for our income tax appointment, we got out another TV tray to have two extensions. 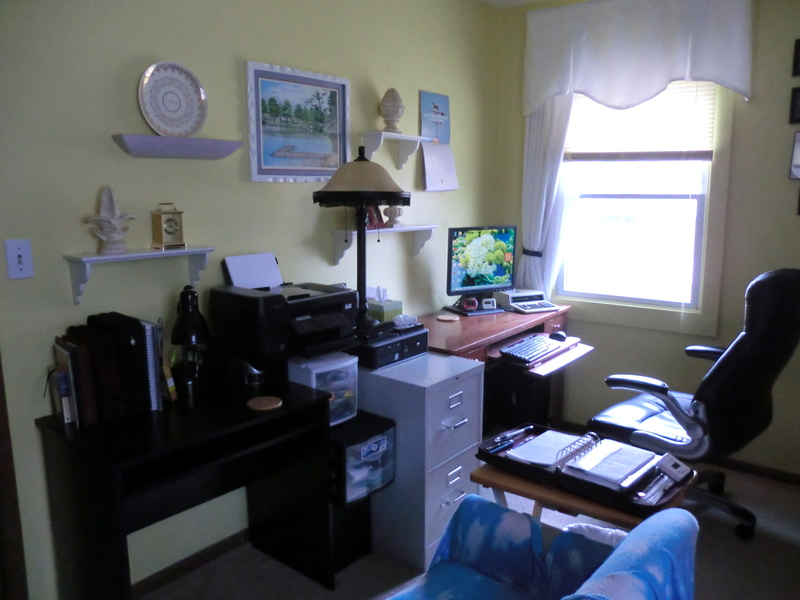 I am amazed how much more efficiently this office works by just switching around the items we already had in the house. Our rearranged office with a TV tray to serve as a desk extension. This entry was posted in Furniture, Use What You Have and tagged Furniture, Use What You Have by Frugal Fish. Bookmark the permalink.